May 29, 2014. That was the last time I posted. I’m still here at In the Night Farm. Still riding. Still writing, though more often in my head than on the interwebs. Still training some, but riding more. Still exploring the world in hiking boots and rafts, on skis and rappel. May 29, 2014. Since then, Jammer and I have completed nearly 1,000 competition miles, bringing his AERC total up to 1,420. I’ve also done a handful of rides on other horses, including Maji (KS Bold Rusha Rain) and HHR Levjis Sualowa, a chestnut mare related to Jammer. We’ve won a ride and a few BC’s, top-tenned more often than not…and completed our first 100. And our second 100. My only regret is that, despite many gains, I have lost the time for regular blog updates. I thought of you all, out there on the 100-mile trails. 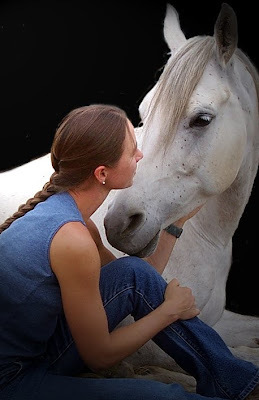 Some of you were there from the beginning, when I had a farm full of untrained horses and a whole lot of will and a distant goal. A distance goal. The 100. I’ll tell you a secret: It wasn’t as hard as I expected. We did the 100 at Sunriver Classic last June, then Oregon 100 in September. I may not have loved every minute of every mile, but I came damn close. Jammer and I have our eyes on the Mount Adams 100, which is coming up in just a few weeks. But our real goal for this year is the iconic Bighorn 100. A mountainous, big-loop 100 (with no returns to camp until the finish), Bighorn is reputed to be as beautiful and challenging as Tevis. If anyone is still out there…stay tuned. I’m considering opening a new blog with a broader scope, wrapping in my other outdoor adventures along with endurance. What do you think? September is still months away, but already Jam and I are fixated on our first 100. 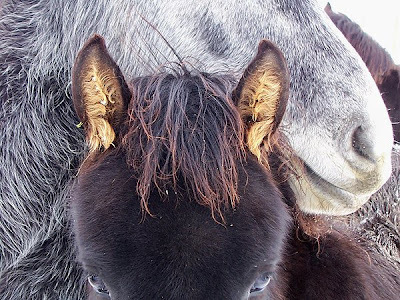 Every ride between now and then will be a shakedown cruise — testing and adjusting everything from nutrition to hoof boots to training to tack. 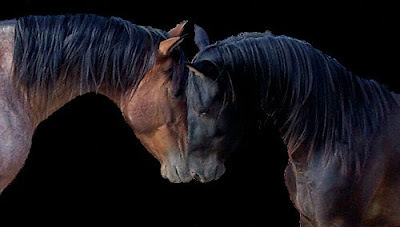 Nagging physical and mental issues (horse or human) cannot be ignored. And, there is conditioning to do. Covering 100 miles in 2 days struck me as the most logical stepping stone between single-day 50’s and a 100-miler. That’s exactly what I had in mind for last weekend’s Owyhee Fandango Pioneer. 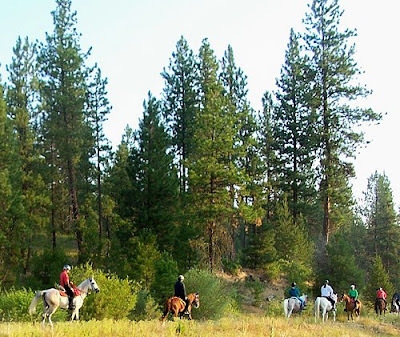 Fandango is a popular ride in the Northwest Region, attracting riders from a number of western states and sometimes Canada as well. I was surprised, last Thursday afternoon, to pull into ridecamp around 4pm and find a lot of open space still available in the lower camp. Lucky me! I selected a level spot with an easy pull-out, knowing I’d be leaving Sunday morning while a lot of trailers remained for the final day. I set out some buckets to save a spot for Jodie and her mustang Sonny, who rode with us at Tough Sucker and planned to do the same on Fandango Day 1. Camp setup, registration, vet in, cold beer, ride meeting…you know the drill. 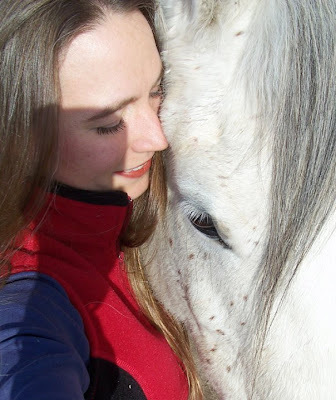 I left Jam booted but unblanketed and settled in for a desert night with lows around 50 degrees, and proceeded to sleep with frequent interruptions by the pawing of a neighboring horse. Come morning, Jodie and I saddled up and hung back from the start. She wanted to work on curbing Sonny’s raciness, and I certainly wasn’t eager for a repeat of the Tough Sucker bucking incident with Jam. As it transpired, all the bending and quieting trail work I’d done with Jam between rides seemed to pay off. 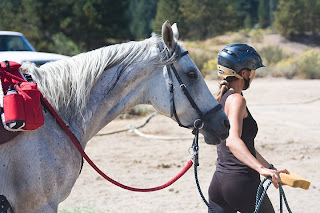 Both horses started pleasantly, walking and jogging to the first creek crossing and remaining calm even when the young mare ahead of us took on the water with a spectacularly hilarious, flying leap-and-bolt maneuver. A steep climb up to the ridge set us on our way. Desert, desert, desert. We trotted as much as we could along the cow trails and 4×4 roads, grateful for our hoof boots but still keeping down the speed thanks to a generous scattering of loose rock. 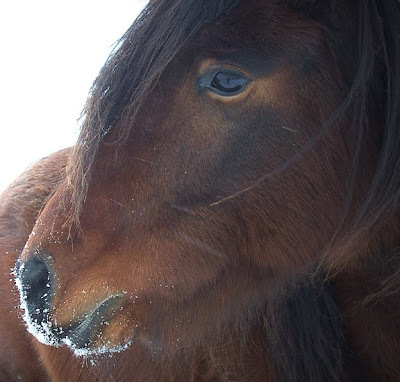 Many of the trails here used to feature pretty decent footing, but the last couple winters have choked up a lot of obstacles, making them tougher on hooves and demanding that we walk stretches we would otherwise have covered at a brisk clip. Not that we were in a hurry. 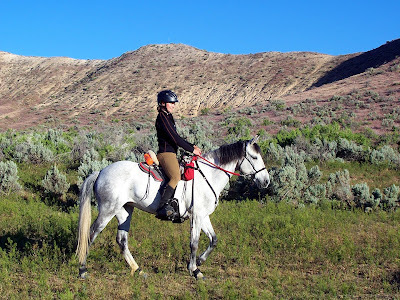 Our goal for the day was to spend at least 7.5 hours on the 50-mile trail, focusing on bringing the horses’ speed down toward an average speed of about 7mph. Good thing, since the route to the vet check took us through Sinker Canyon. Sinker Canyon is a lovely little spot featuring repeated stream crossings, low-hanging branches, multiple gates, and a whole lot of rock. 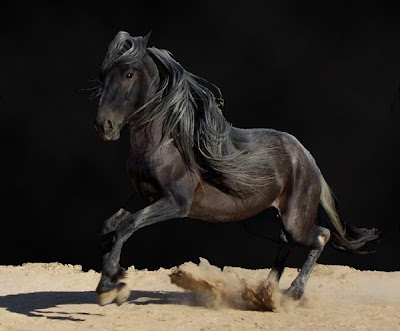 If you care about your horse, you’re pretty much destined to walk the entire five miles. It’s scenic down there, but I’ll be honest: Sinker Canyon isn’t my favorite. Too slow. Too slow for me, and definitely too slow for Jam. 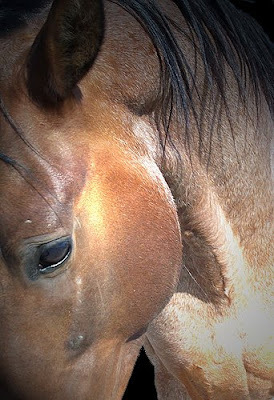 It can be hard to pass in the narrow places, and horses tend to get bunched up as they stop to drink or open gates. Jam’s fast walk complicates matters; he really doesn’t like being smashed up in a group, especially early in a ride for which he’s more than fit. So, Sinker was a bit stressful to begin with. There was no need to throw in a rattlesnake. Jodie and I rode around a corner about halfway through the canyon, feeling good about managing to stay in a small bubble between other riders, to find a crowd gathering on a narrow bit of trail leading down to yet another creek crossing. Word floated back from those at the front: Rattlesnake! Right there, trapped against the cliff and rattling away. He had nowhere to go, so urging him with long branches and tossed pebbles was useless. Passing on the trail was obviously unwise — and even if we did, how would we warn riders to come after? Hmm. We were contemplating dropping off the trail’s edge and sloshing down a deep stretch of creek to bypass the snake when a rider in the back of the scrum dismounted and pushed his way forward. Before anyone knew what he was planning, he chucked a basketball-sized rock at the snake. Bam! Smash! Rattle rattle rattle. The snake was trapped beneath the rock, doomed but still rattling. Some cheered, others frowned. 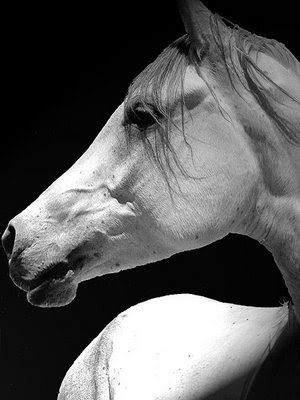 I just worked to manage my horse (who was doing well, but starting to lose it) in the increasingly restless crowd. Now, the riders coming behind us would be safe, but our present group still had to get around the very angry rattler. We decided to risk the deep water rather than squeezing through the narrow spot where the snake — a good-sized one about 2 inches in diameter — still rattled away. Jam hesitated at the edge of creek. Leaned over the dropoff. Lowered his head. Snorted. Plunged down. We sloshed into the belly-deep water and I felt him gather as if to run, or buck, or possibly tuck his hind feet beneath himself and roll. Oh no! None of that, Buddy Boy! I clapped him with my heels and we surged out the other side. Whew. 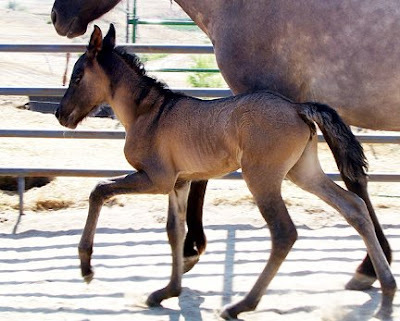 To my relief, we finally made it through the canyon and were able to trot some on the climb up to the vet check. Sonny took a few, extra minutes to come down to criteria. (Not being an Arab, this is typical for him.) Meanwhile, the vet took a look at Jam and asked “When are you going to start using him?” It’s nice to have a lily-fresh horse 25 miles along a hot, rocky trail. Jam ate very well and Sonny moderately. Both drank a lot and looked great, so Jodie and I let them speed up a bit on the second loop, grateful for better footing. We were about 10 miles from camp when Sonny hopped sideways in surprise. The cable on one of his Renegades had snapped. Drat. Jodie pulled both boots off him (he was already bare in back), and thanks to lots of barefoot conditioning and those tough mustang tootsies, we made it back to camp just fine. We cruised in at 7 hours on the nose — faster than we’d intended, but feeling as though we hadn’t rushed the horses or let them get away with pulling us down the trail unrated. It had been a comfortably (even easily) paced day, so we were quite surprised to find ourselves in the top 10. Sonny was a bit sore on his left hind and we knew the first place horse was well ahead of us (58 minutes, to be precise), so neither of us chose to show for BC. Instead, we headed back to our trailers to clean up the horses, slather their legs with poultice, and ply them with feed before indulging ourselves with shorts, camp chairs, and beer. 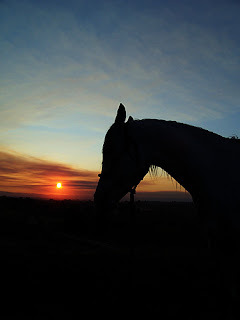 Dusk brought a windstorm that drove up dust and hurried us into our campers, leaving our horses covered with light sheets and well supplied with hay. Gusts swayed the camper all night, disrupting sleep, but morning dawned even warmer than the previous day. I stripped to a single layer before mounting up. Jam and I made decent time on the first loop, knowing that the second would be slower due to terrain. Sure enough, Loop 2 featured some technical work including numerous crossings of steep-sided washes that involved easing down 8+ foot drops, then immediately lurching up the opposite sides. It pays to have a level-headed horse for that kind of work. We’d passed 6 or 8 horses during the first loop, and the riders closest behind me must have been a bit late out of the hold, because I was delighted to find Jam and myself alone in a nice, big bubble. Once in a while, we spied other riders a mile or two ahead or behind, but for all intents and purposes, we had the trail to ourselves. I even pulled out my phone to play some music (out loud, not through earbuds, as I like to be aware of my environment and my horse’s footfalls). 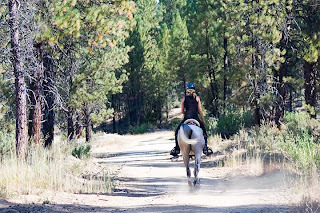 Gradually, we caught and passed the closest pair of riders, leaving them behind as we reached Hart Creek and crossed it to get to a lollipop section of trail featuring an endless sand wash. I used the wash as an opportunity to drop my stirrups and stretch my legs. Trotting there is a bad idea; the sand is too deep and bowed tendons are a real possibility. So, we walked our way to firmer ground…which turned out to be not just firm, but rocky. Good lord, was the rest of that loop rocky! We trotted where we could, but it was rough going. Hot. Steep. Windy. Rocky. Really hot. Really steep. Really windy. Really rocky. By the time we clambered up the knife ridge — one of my favorite parts of the Oreana rides, where the desert spills away on all sides, littered with boulders and sage, crinkled into an endless series of plateaus and ravines — even Jam was asking to stop. Rough going, indeed. I dismounted and walked beside him for a while. We reached the final water stop, where he drank while I sponged his forequarters and belly. Refreshed, Jam bounced back to his usual self for the remaining miles. 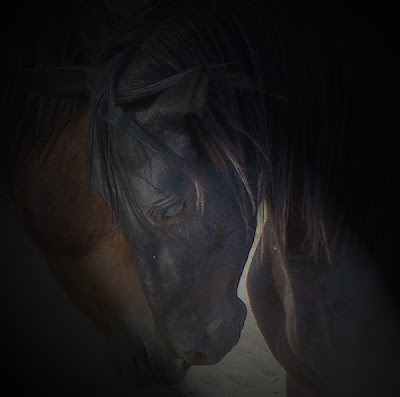 He trotted into camp with pricked ears, bright eyes, and plenty of compliments from the volunteers at the timing table. To my immense surprise, I learned we had top-tenned again! This time, the first-place horse had been slightly off (not enough for non-completion), so it was worth our trouble to stand for BC. As it turned out, Jam was completely sound on his initial trot-out but displayed some shifting soreness (muscle stiffness, or, more likely, foot-weariness from all those rocks) during the BC exam, so that took BC off the table. I wasn’t fussed. Jam was happy, healthy, eating and drinking well, and seemed to have enjoyed his first multi-day ride. And despite our completion time of 7:56, we’d maintained his all-top-10 record. Jam ate his electrolytes in a mash of wheat bran and dry cob. No syringe dosing! I kept myself hydrated. The key was wearing a 40-oz Camelbak so it’s easy to take sips even with my hands are busy controlling an energetic horse. My legs remained almost pain-free, with compartment syndrome symptoms under control. Prescription orthotics, preemptive ultrasound, anti-inflammatories, calf stretching, and a slower pace all played a role here. I have an eyeball on riding 2-3 days at Strawberry Fields Forever. It’s a 7+ hour haul down past Salt Lake, but the ride has an excellent reputation and the timing (mid-late June) is ideal. And, I’m told there aren’t many rocks. Well, Jammer finished Tough Sucker II strong and sound. I finished. We had a fun ride — especially after hooking up with Jodie & Sonny and Chris & Anna around mile 12 — but it wasn’t my most painless ever. At the start, Jam was impatient but cooperating. I held him in as we walked to the start, chatting with another rider…and then I flew through the air! No gathering. No ear shift. No warning at all. Just a big, huge, double-barrel kick-buck that sent me sailing right over his head without so much as touching the saddle or grabbing for mane. I was up on my feet again almost as soon as I hit the ground. Where’s my horse? Is he ok? What the HELL just happened? Jam had stayed put, looking surprised and alarmed (in retrospect, he could have had the grace to throw in some guilt), and seemed unharmed. Despite all the people around, nobody really seemed to have any ideas why he bucked. His tack looked fine. It hadn’t felt like a spook. I dunno. My best guess is that it was a combination of his interference boots (which do make him stompy until he calms down a bit; I probably shouldn’t have put them on until the second loop) and sheer exuberance. Anyway, I mounted back up and started trotting while I assessed my injuries. I seemed to have landed on my back-left side. It gradually became apparent that my elbow and hand got the worst of it. Something was moving strangely in my middle knuckle, like a tendon snapping back and forth across the joint when I flexed my fingers. 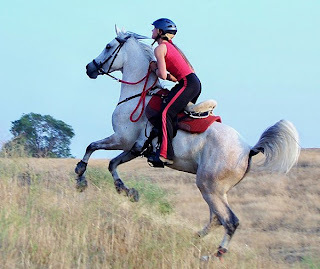 Fortunately, I was able to hold the reins without much trouble — and good thing, because Jam was full of vim and vigor. I worked to control his pace for most of those windy, blustery 50 miles. We finished in 6:35 and pulsed right down, trotted out, and walked back to the trailer with all A’s. Well, Jam walked. I limped. It wasn’t just the fall. True, my hand and elbow still hurt (especially the hand, which refuses to do things like remove tupperware lids) but X-rays say nothing is broken. My bigger concern was the now-familiar ache in my shins. For quite a few 50’s now, I’ve had trouble with shin pain. It occurs in both legs, though the left is always worse. By about 20 miles, they are swollen and sore along the outside of my shin bones, and after 50 miles, they look like someone beat them with a 2×4 — only there was no impact. All that swelling and bruising is from pressure and bleeding on the inside. It hurts like hell, and it takes a couple weeks to recede. Compartment syndrome. Specifically, chronic exertional compartment syndrome. Anterior and bilateral, in my case. One of the sports med docs actually treats another endurance rider with the same issue, though it is much more commonly associated with runners. Basically, the muscles in the calf are bundled into four “compartments” bound by fascia. Fascia isn’t particularly flexible, and in certain people, the muscles can get too large for their fascia sheaths, which results in pain, bruising, and compromised circulation (from the swelling) when they participate in certain activities. Great. Even better, this particular malady doesn’t come with a cure. There’s a surgery available in which they slit the fascia in order to relieve pressure on the muscle, but results are mixed and the condition can recur. Fortunately, neither doc thought I was a candidate for surgery just yet. 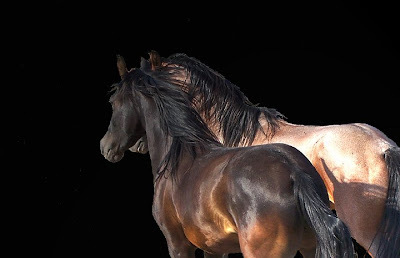 They suggested a variety of more conservative approaches, the most important of which are calf stretching (so the muscles in the front of my shin have less tension against which to fight when I drop my heel to ride) and orthotics (because I overpronate, which puts extra strain on the affected muscles). Management with ice and ultrasound are also on the table, though of course that’s impractical during a ride. I’m looking into compression sleeves (Doctor Google offers mixed opinions on compression sleeves for compartment syndrome) and foam rolling. I already eat an anti-inflammatory diet, but I’ve added some additional nutritional support — most notably, cod liver oil — to assist further. Anyway, the orthotics and stretching seem to be doing a lot of good; I’ve put in long hours conditioning lately and haven’t had any trouble. The real test will come next weekend at Fandango, where Jam and I plan to attempt his first back-to-back 50’s. Jam, by the way, looks fantastic. He positively inflated with muscle after Tough Sucker, and is raring to go. (Not not literally this time, I hope!) We’ve been focusing on polite pacing during our rides because as we increase distance, we’ll need to slooowwww dooowwwn. It might be a bit of a battle during the first loop on Day 1, but tough tarts. He’s gotta learn. I have a tendency to get caught up in rides. It’s not race brain. I don’t over-ride my horse in the hope of getting ahead. I just get busy. Focused. Too busy to spend a few seconds testing a theory. Well. I need to get over that, because there are things I need to know before I enter Jam in our first 100. In order to know them, I must test them. Home testing can only go so far. 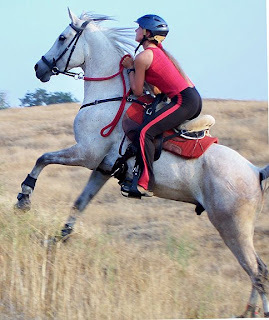 Sometimes, you have to experiment with what a particular horse will do at a ride. Snacking. I need to figure out what Jam will eat along the trail when there’s no forage. Commercial horse cookies are out; he won’t eat those even at home. What about grain? Alfalfa pellets or cubes (at water stops), which he’ll eat out of his tub at home? Please tell me I don’t need to carry a backpack full of hay. We’re going to try alfalfa-oat cubes on Saturday. Electrolytes. So far, I haven’t managed to get Jam to eat electrolytes at a ride, so I always end up syringe-dosing, which he hates. I’d love to find a less stressful and messy method. He isn’t a big mash fan (bran or beet pulp), but I have discovered that he’ll eat slightly-moistened, unsweetened COB with half a dose of Quench per pound…at home. This weekend, I plan to find out whether he’ll do the same during a ride. I suspect not, but it’s worth a try. If that doesn’t work, Plan B is to pick up a bucket of Perform N Win, which a recent discussion on the AERC Facebook page indicates is sweet and preferred by many horses. Plain old calories. At rides, Jam prefers hay and grass. This is all well and good for a 50, but I suspect he’ll handle 100 miles better if I can get some concentrates into him. He really likes dry COB (sans electrolytes) at home, so I’m hoping that will carry over to rides. We’ll try that on Saturday. And then there’s me. I need to get better at sipping water on the trail. I bought a little-bitty (40 oz) Camelbak at Backcountry Pursuit (shameless plug for you Boise-area readers!) for skiing and riding. I haven’t actually tried riding in it yet, but I suspect that having a bite valve right there at my shoulder will help. I might test this on Saturday, but we’re in for stormy weather so there’s a good chance that particular experiment will have to wait for Fandango next month. Okay, all. I have my marching orders. Hold me to it. In all these years, I have never made it to a Tough Sucker ride. Maybe I just don’t want to be a sucker. But more likely, circumstances have always pushed me out of the running for the first spring rides in my area — Tough Sucker I (early April) and Tough Sucker II (late April). Weather, tack issues, whatever. I’d have to go back and have a look to recall. Or maybe I don’t want to. The point is, I never had a horse ready. But TS II is still ahead. Next weekend. And I think Jammer is ready. And so am I. We spent today on a long ride in the hills, and I registered for the ride this evening. Could it be? Are we finally Tough Enough? Nearly seven years have passed, but I remember my first LD like it was just last May. I had so much to say afterwards that I needed two, lengthy posts to tell the tale. Later that summer, my good friend, a photographer, drove a couple hours on a frigid morning to document my first 50. That story also took a long post, plus some related posts, to tell. Since 2008, I have completed 30 endurance rides, plus a few LDs before I gave those up altogether in 2009. My record is hardly notable — riding with friends like Karen Bumgarner has a way of keeping a person humble — but still, 30 rides will get you a long way down the road. 1515 AERC miles, to be exact. That’s enough miles to make your average 50 nothing to write home about. Oh, it’s still one of my favorite ways to spend a day. It’s still fun and beautiful and painful and sweaty and all the rest. 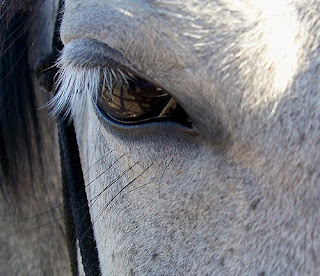 It still gets my attention and makes me look for ever-better ways to prepare and care for my horse. But it just isn’t the big deal that once it was. It isn’t a major challenge. It isn’t sufficiently HARD. I’ll tell you what’s next. 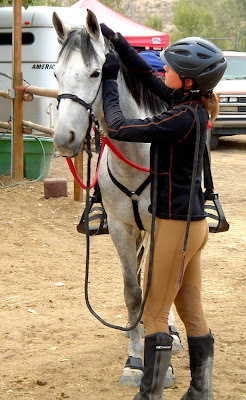 It’s what I’ve wanted from the day I first learned that endurance riding exists as an organized sport. It’s the thing that still lures me, still scares the crap out of me, the thing I must do.